Different types of design will be more or less suitable for different types of transfer printing. For example, full colour photographic images are normally best suited for Dye-Sublimation, Digital Print and Cut or Digital Screen Transfers. Designs with a limited number of colours might be more suited to Cold Peel Plastisol or Hot Split transfers. You can upload an image to us using the upload form on this page and we can advise on the most suitable type of transfer. The more information you can provide us the more advice we can give. Useful information includes the quantity you are looking for, the size of the transfer and the material to which they will be applied. Read on for general guidelines for providing artwork for print. Revolution offer a full artwork service. We can design your transfers from the ground up or adapt your existing artwork into a suitable format. You can also provide us with completed artwork ready for print. Below are some guidelines for providing print-ready artwork. Raster images (also often referred to as Bitmaps) are ones which store the information for each pixel (or dot) individually. This is great for full-colour photographic images and so if you are looking at a Dye-Sublimation, DST or Digital Print and Cut transfer then a raster image - such as a Jpeg or TIFF image will be fine. The higher the resolution the better, however, and so we would normally require the image to be 300dpi or higher at the required print size. Vector images, on the other hand, contain information about the various shapes - e.g. squares, circles, curves - that make up the image. This is our preferred format for transfers that require a limited number of discrete colours such as Hot Split and Cold Peel Plastisol although high-resolution Photoshop (or similar) files with the colours on separate layers or channels may well be fine. Examples of vector file formats include .ai (Adobe Illustrator) and .svg (Scalable Vector Graphics). Vector images tend to be less detailed and photo-like than their raster cousins. One noticable advantage they have, however, is illustrated in Fig.1. 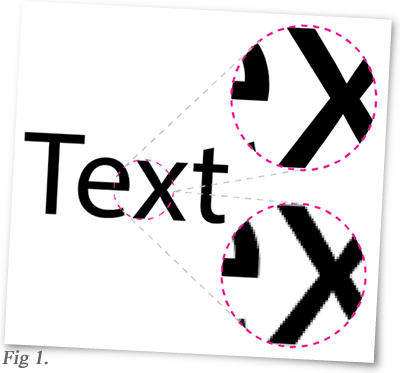 When you zoom in to a raster image you get closer to the individual pixels that make up the image and so the image edges become jagged or 'pixelated' as shown in the lower circle. A vector image can simply re-draw the image closer up using the shape information contained within. A vector image retains it's sharpness no matter how closely you zoom in. This makes vector images perfect for transfers that are screen printed as it gives sharp edges and fine detail. For DST, Plastisol and Hot Split transfers we print by the sheet. If you wish you can provide individual designs and we will create the sheet layout for you. We will fit as many on to a sheet as possible while still allowing a reasonable gap between the designs to aid cutting of the individual transfers. If you prefer you can lay out the whole sheet design yourself. See the pages for each different transfer types for information on page sizes and layouts. We also offer a full artwork service. If you need original artwork creating or older artwork redrawing then our artwork team will be more than happy to assist. Contact us here to find out more.